The agency cites trade friction between the U.S. and China as one factor. Japan is expected to eke out 1 percent growth this year, up from 0.8 percent in 2018 but slightly down from the fund’s earlier forecast. China’s prospects brightened, the fund said, after President Trump decided to suspend a planned increase in tariffs on $200 billion worth of U.S.-bound Chinese exports. 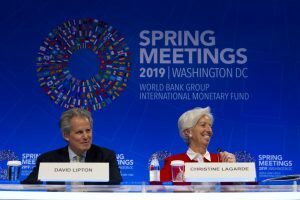 The IMF expects growth in world trade to drop to 3.4 percent this year – a sharp slowdown from the 4 percent it had expected in January and from 3.8 percent trade growth in 2018.